When I first saw this truck I thought, "Nitro? No way." It has nitro in the name and it even has what look like an exhaust tip and a heatsink engine head (the red thing on the back) from a hobby-level nitro (kinda like gas) powered RC, but that's all for looks. This is a safe, normal, electric vehicle. With that out of the way, the truck looks good. Many things about it remind me of the great old Hot Wheels Dune Devil Pro that I enjoyed so much, only this one is larger. I don't know why they call it the Nitro Power Racing "Buggy," because it's a truck. I'll just call it a Nitro Racer since that's what the stickers say. The body is sleek and fashioned after a hobby-level "stadium truck" with wide suspension and slightly oversized tires. Those tires are real rubber and moderately soft, though they're a bit stiff around the edges. The truck has real spring suspension, independent up front and semi-independent at the rear. The springs are a little on the stiff side, but they should be loose enough to help with landing some jumps -- if it can jump at all. 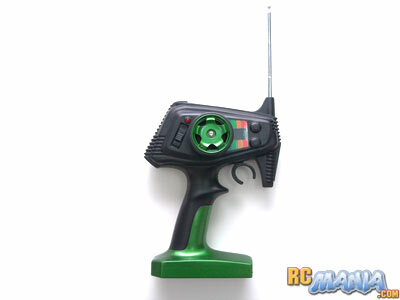 The controller is pistol-style where you hold it like a gun in one hand, the "trigger" controls throttle, and a wheel is there for steering. The throttle is digital proportional so you can go very slow or full speed, or a number of steps in between for better control. The steering wheel, hoever, is not proportional, only allowing you to go full left or full right. 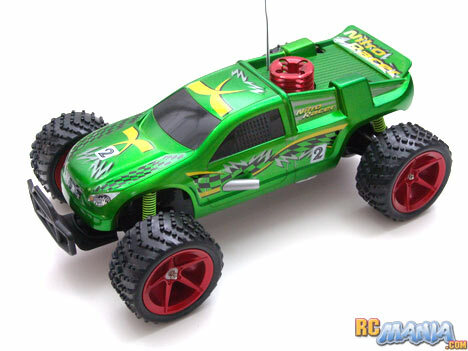 The Nitro Racer comes with a rechargable 9.6V Ni-Cd battery pack and a wall charger. The battery is compatible with most on the market (except for New Bright's exclusive setup), so it's easy to find spares. Once you're charged up, you're ready to go. I ran the Nitro Racer briefly on the street, and then got video footage of it running on a real RC offroad track. I'm very happy with the speed, and it was actually faster than one small hobby-grade RC I also tested that same day. The proportional throttle helps keep the truck under control, as you can start slowly to avoid spinning out, or slow down in turns without stopping. The steering is like an on/off switch, though, so it's sometimes easy to turn too far. I recommend slowing down when turning on a loose dirt surface. On the street it was just fine. What really impressed me the most was how the truck jumps. I've never tested a toy-grade RC that jumps so well! The combination of the speed, the right-sized tires, and th spring suspension let it get scale-realistic air over small & medium jumps and ramps and if you line it up right, it's actually really smooth. I'm pretty impressed by the Fast Lane Nitro Power Racing "Buggy," even if it's not a buggy! It looks good, its top speed is good, and its jumping ability is excellent. Even comes with the battery & controller. For $59.99 US, a price that may even come down a bit over the coming months, this is a good deal. It's definitely not "hobby level" or "hobby grade" like some of the promotions say, it's just a really good toy. I only wish this truck had proportional steering, and that the tires were a little more grippy around the edges. On loose dirt or otherwise slippery surfaces, because of the scale power of the truck, it can spin out if you're not careful. Take it easy on the throttle when starting or turning, and you'll do just fine.